One of the main attractions on the east coast was this coral formation 25 feet high and 100 feet long, which had been carved out by the pounding surf over the course of the centuries. Unfortunately in September 2005 the sea reclaimed its own. 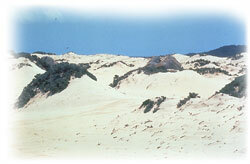 A favorite pastime along the beach here is to join the locals in dune sliding. Sneakers and a strong pair of jeans are definitely encouraged. On the southeastern side of the island is the oldest town in Aruba, Savaneta, the original capital. This is where the Dutch first settled after re-establishing control of the island in 1816. Today, it is an active fishing village, but there are still the remnants of an earlier time. 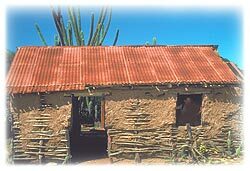 The oldest house in Aruba, a cas de torto or mud-hut dating back some 150 years, is still standing here. Just north of Hooiberg, a strange geological formation of large diorite boulders looks as if it had just been dumped here in a pile. Scientists still have not been able to explain how these rocks got here. Named for the offshore wreck of a famous ship, the isolated northwestern tip of the island features some of the most spectacular scenery, with large rolling sand dunes and an old stone lighthouse that is, however, closed to the public. Nearby there is a restaurant offering refreshments and dining at night. 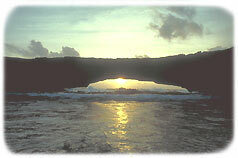 Diving here is recommended only for the most experienced divers. These caves, which are located in the interior of the island, are where ancient Indian paintings and petroglyphs have been carefully preserved. The Papiamento word for 'countryside,' the Cunucu is the rugged, rambling interior of the island which is generally flat but punctuated by all kinds of vegetation. Small pastel houses fenced in by cactuses line the roadside. Near the site of the first gold discovery is a functioning coconut plantation. Northwest of the Spanish Lagoon, Balashi still preserves the ruins of an old gold smelting plant that was used during the nineteenth-century gold rush. Today, this area hosts Aruba's desalination plant where all of the drinking water is produced. While on island, please don't forget to order a Balashi Cocktail. More than 80 species of migratory birds from herons and egrets and cormorants to coots and gulls, skimmers, terns, and ducks nest in and around these two interconnected man-made lakes. The second largest city in Aruba, San Nicholas is a modern development that rose with the island's oil boom. The area has a typical British Caribbean heritage. It is the birthplace of Aruba's Carnival, the third largest after Brazil and Trinidad.